Quote Quotes are optional. A quote is an offer to sell one or more items to a customer at the price you specify. When you produce a quote, you specify a date on which the quote expires. The customer can accept the quote up to that date. After that date, it is your choice whether to sell to the customer at the quote price. Note that a quote is not a sale. When you produce a quote, the system does not update any quantity or sales statistics, because there is no sale yet. 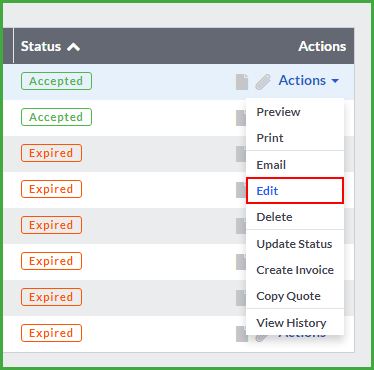 Quotes that are expiring today or have already expired are displayed in the Company Dashboard. Sales Order A Sales Order is raised when an initial Quote is approved, and the transaction is underway. The Sales Order specifies the details about products ordered by a specific customer along with the price, quantity and terms and conditions. The user can opt to reserve the items contained in a Sales Order to avoid selling this stock to a different Customer. Invoice When a customer purchases from you, you process an invoice. An invoice is a document of sale. If you first produced a quote for the customer, you can link the quote into the invoice and print it without having to redo any data entry. You deliver the invoice to the customer along with the items you sell. Customer Credit Note If a customer returns an item you sold to them for a refund, you process a customer credit note. The values you enter into a customer credit note will reverse the values you entered into an invoice. The amount the customer owes you decreases, as do the sales quantities and sales values per item. Customer Receipt If a customer pays for his/her purchase, you will process a customer receipt as proof of payment. You can customise your customer documents. Remember that when you are processing and the system detects no activity for 2 hours, the system logs you off for security reasons. You are able to select the customer processing screens by clicking on the Customers menu and then selecting the document or transaction that you want to process from the list. In the header section, you choose the customer account or add a new customer. You can also do a quick customer account enquiry, by clicking in the information icon. You then enter or select one of the multiple delivery addresses and other information, such as the document date. The tax reference field is for your customer’s tax number. 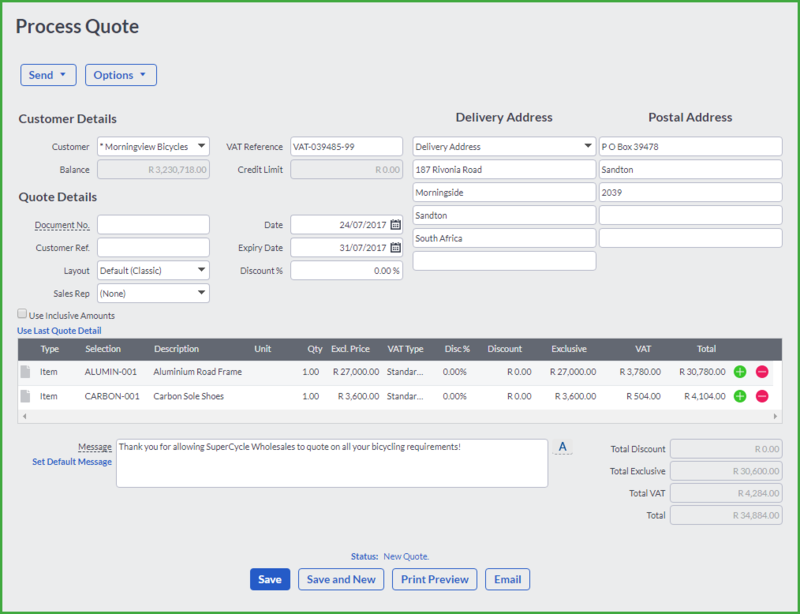 Also in the header section, you can select a quote to link to the invoice using the From Quote field. Lines processed in the quote will be copied over to the invoice. This section also details the status of the document. 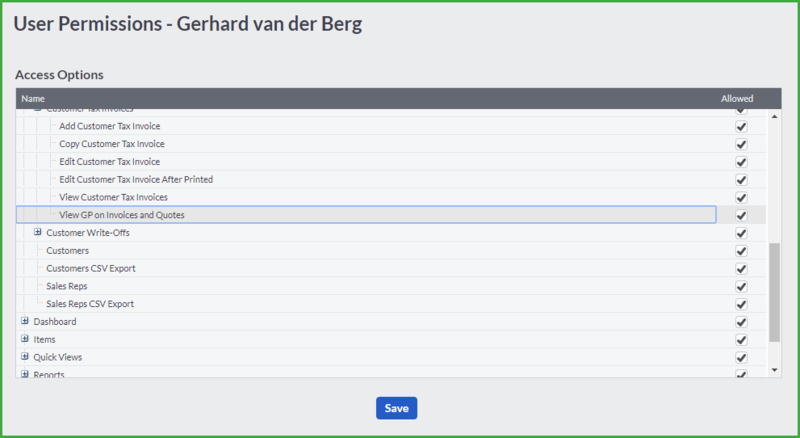 In the header section, you have the option to select a sales rep as well as changing the layout of the invoice when it’s sent to the customer. The lines section of the screen you will use for processing items and other charges (that do not form part of your main trading activities, for example, delivery charges). 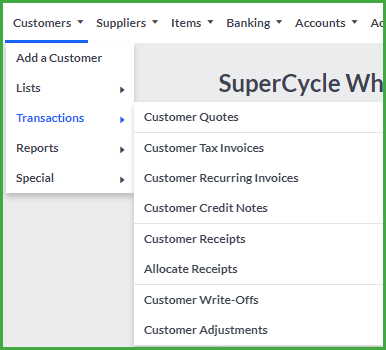 Under the Type column you will select whether you want to invoice an item or select an account. You enter each item or account on its own line, with the required quantity and price that you are selling for at the stage of processing the customer document. You can add a discount percentage or a discount amount in the respective fields. Click on the button to change the price list for the transaction line. Email – to email a PDF copy of the document to the customer. You can send the invoice to different people within the customer’s company by clicking on the Additional Contacts button. 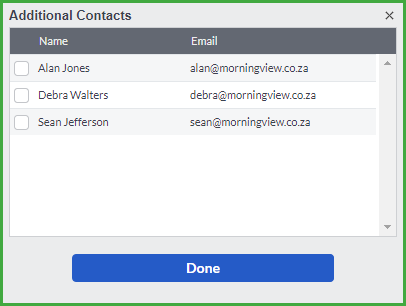 These email addresses will pull from the Additional Contacts tab on the Customer Masterfile. You can select that the system uses the default email signature, or you can select an email signature that you created in the Company Settings…Email Signatures screen. You can also attach additional documents to your email, but it cannot be bigger than 1 MB. Print Delivery Note – to process the document and print out a delivery note for customers to sign. You can also email a delivery note to customers. If you enter a Physical Item (This does not apply to Service Items) that does not have a cost recorded on the system, the system will notify you accordingly. Should you choose to process the Item without a cost amount, please be aware that the calculation of Cost of Sales on the Profit and Loss report will be affected! Furthermore, once the Invoice is processed, you cannot go back to change the cost of the Item on that Invoice. This can only be rectified with a chargeable Data Fix. After you have processed an invoice for a customer, the Use Last Invoice Detail feature is enabled. Use Last Invoice Detail will display as a link after you have selected the Customer. 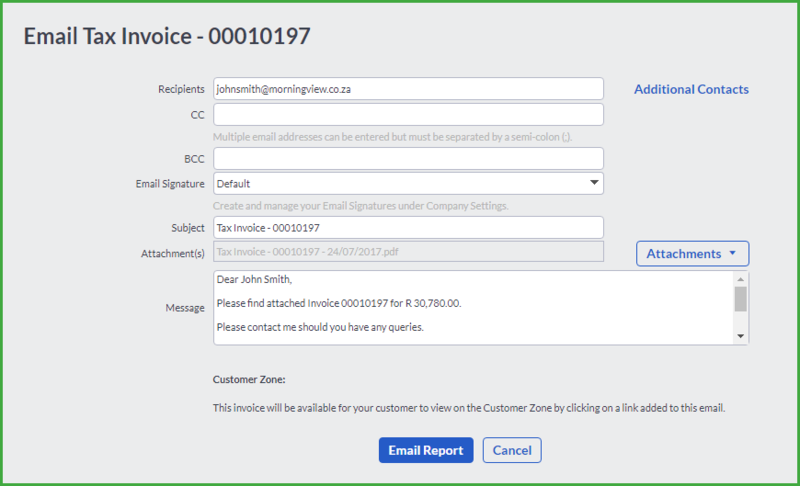 This feature allows you to copy invoice details from the previous invoice that was processed for the selected customer. Use Last Invoice Detail is particularly useful when you have customers that buy the same item(s) on a regular basis. Click on the Use Last Invoice Detail link and the system will copy the previous invoice’s details onto the current invoice. Once the detail displays on the invoice, you can continue editing the invoice as normal. 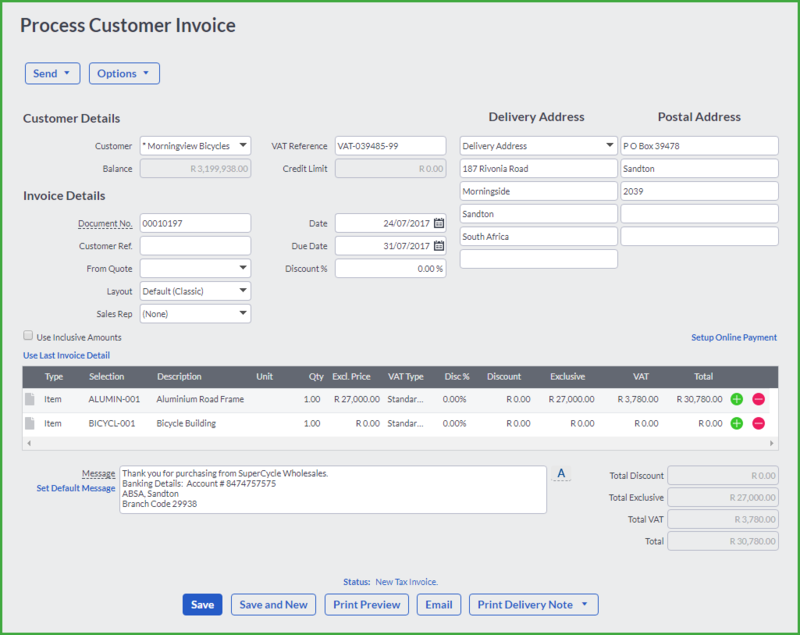 Accounting allows you to add additional fields to the Invoice screen. These fields can be used when you have to display more information on an invoice for example, a medical company can add their medical practice number etc. If a customer requests a quote, click on the Customers…Transactions…Customer Quotes option. Click on the Add Quote button to create a new quote. You can also change the status of a quote to Accepted, Declined or Invoiced. Select the customer in the Customer field and enter a reference number or name in the Customer Ref field. If there is a sales rep that must be allocated to the customer, select the sales rep in the Sales Rep drop down menu. Select the items or accounts that the customer requested prices for. Enter information in the Message field informing the customer of some limitations or business processes with regard to quotes. 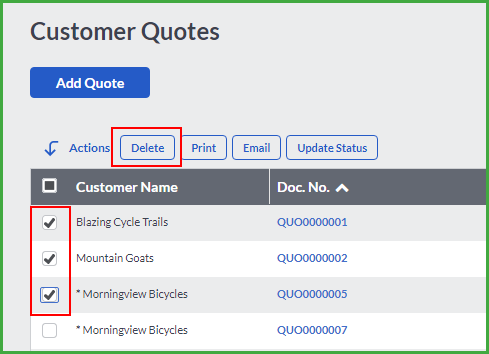 To edit a customer quote, click on the Actions option on the specific line and select the Edit option or you can click on the green document number (Doc. No.) link. You have the option to convert a Customer Quote into a Customer Tax Invoice. In Accounting there are two different ways of converting a Quote into an Invoice. Accounting will notify you that you will be converting the quote into an invoice. Click on the OK button to change the quote status to Accept, or click on the Cancel option to set the quote as Declined. 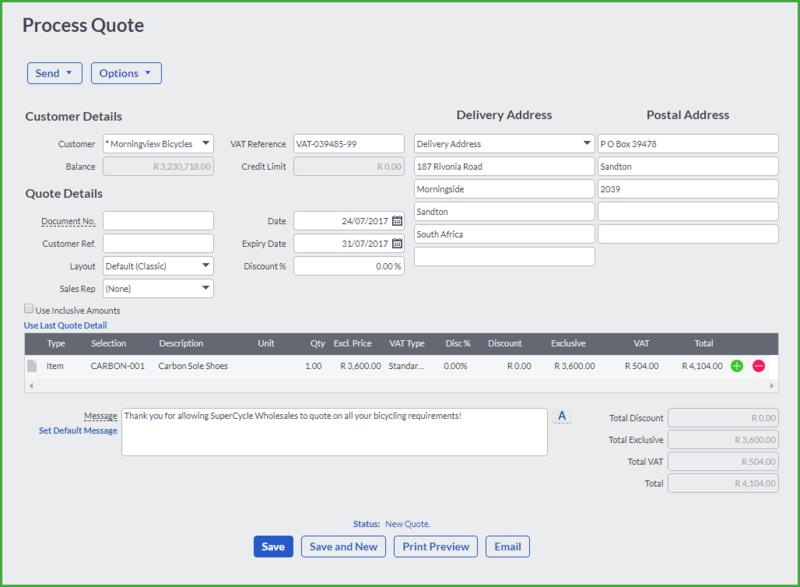 To perform this action, click on the Actions button in the Quote line and select the Create Invoice option. 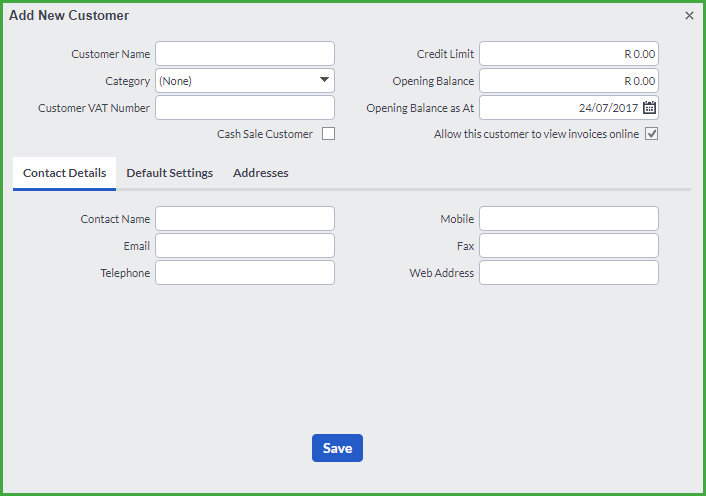 Accounting will then open the Customer Tax Invoice screen with all the information. If a customer requests a sales order, click on the Customers…Transactions…Customer Sales Orders option. Click on the Add Sales Order button to create a new sales order. Complete the Customer and Sales Order details. Below is a customer credit note screen. You will process a Customer Credit Note when the customer returns items for a refund or replacement. 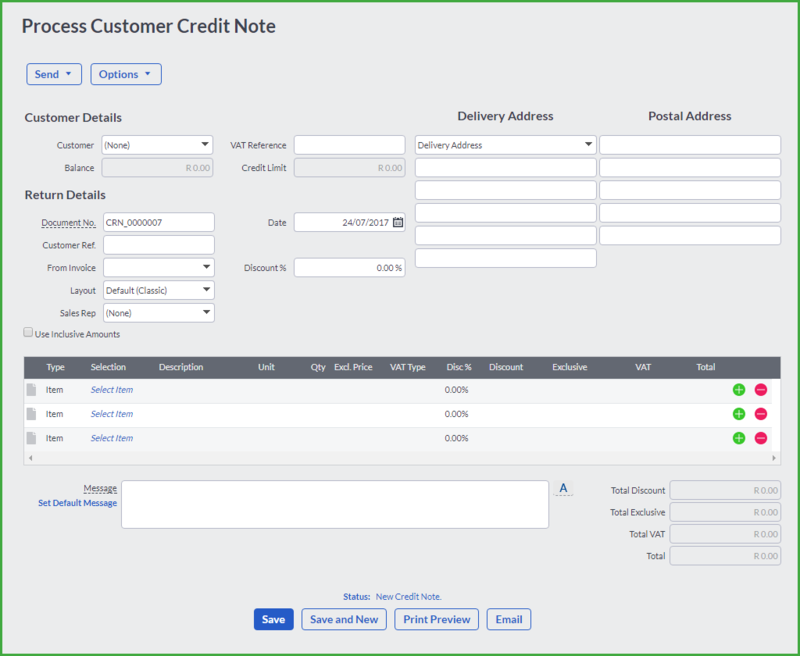 Click on the Customers…Transactions…Customer Credit Notes option. Click on the Add Credit Note button. 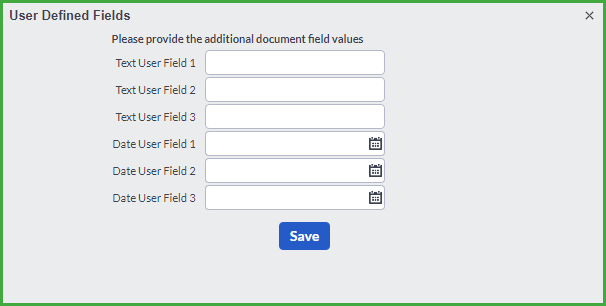 Complete the header fields. Remember to link the return to an invoice by selecting the affected invoice from the drop down menu in the From Invoice field. Select the sales rep affected by the credit note in the Sales Rep field. Change the necessary transaction line by amending the item quantity or item description and process the document using the four processing options at the bottom of the screen. 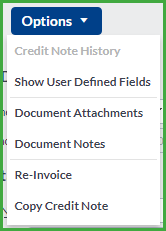 To edit a customer credit note, click on the Actions option on the specific line and select the Edit option or you can click on the green document number (Doc. No.) link. In the header section, you choose the customer or supplier account, and enter the transaction details, including the amount. You also specify which bank account you are using. Also in the header section, Description and Comment fields are available to record notes or information concerning the transaction, should you want to. You will select the type of payment that you are receiving; whether it is a Cash, Cheque, Credit Card or an EFT payment. You can also select to reconcile the transaction. In the lines section, you link the transaction to one or more invoices. 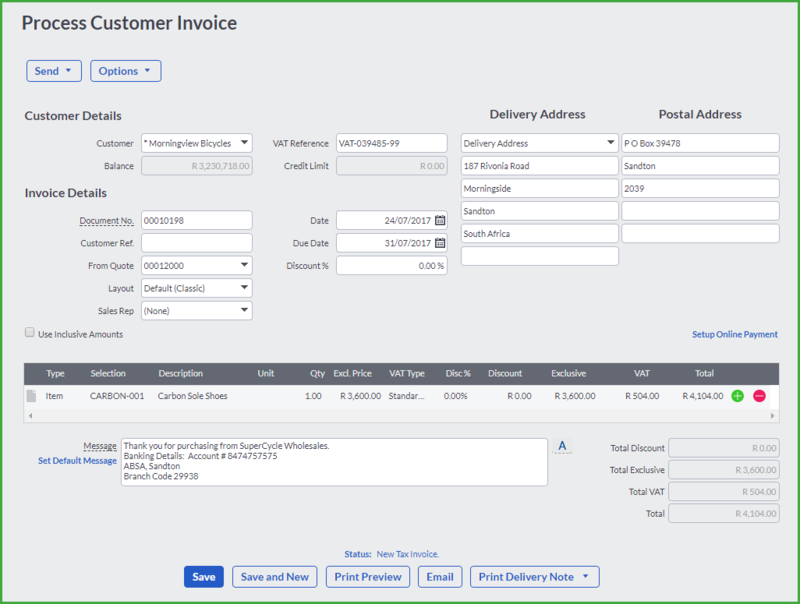 Until you fully match invoice values with one or more receipts, payments or write-off transactions, the invoice displays on the customer or supplier statement. 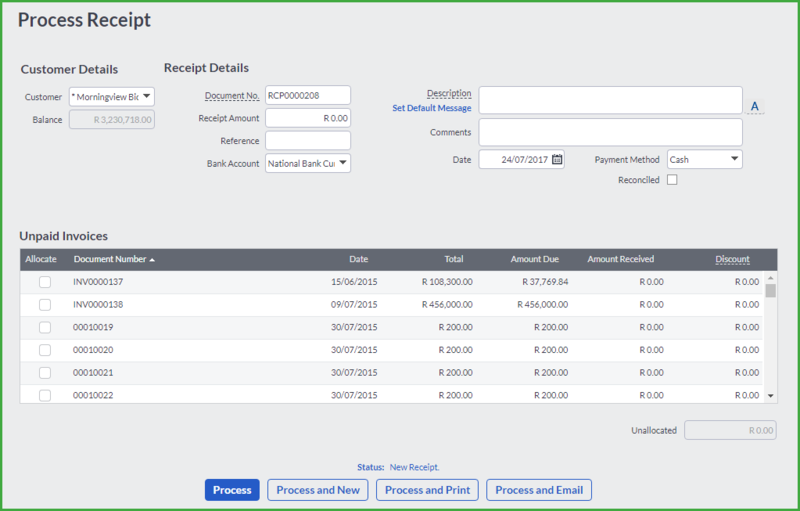 You can match the receipt, payment or write-off at a later stage using the allocations screen. When a customer or supplier is set to automatically allocate receipts or payments to the oldest invoices, the system will automatically allocate them in this screen. This includes receipts and/or payments processed via the bank and credit card transaction option. Process and Email – to save the document and email a PDF copy to the customer. Once you print a customer receipt or supplier payment, you cannot edit it. If you need to correct a transaction, you will need to reverse the entire transaction by processing another receipt or payment, but with a negative value. You can do this by entering a minus (–) before the value. Use the same date and reference number on your transaction to make it easier to reconcile. Enter all the important information to create the customer masterfile. Click on the Save button to continue processing. Accounting allows you view your gross profit percentages per item on your customer invoices. This function is only available if the main Accounting user grant access to another user. Click on Administration…Control User Access and click on the Permissions link next to a user in the “Users that have access to…” section. 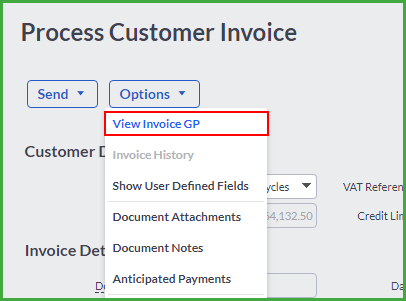 Expand the Customers…Customer Tax Invoices option and check the View GP on Invoices and Quotes check box as displayed above. Click on the Save button to grant access to this functionality. You will have the option to view the Gross Profit percentages on the Average Cost and Last Cost.